Made possible by a grant from the National Science Foundation and the State of Florida, the Microkelvin Research Laboratory is the largest ultra-low temperature laboratory in the world and the only one of its kind in the United States. Research here is primarily concerned with the fundamental properties of liquids and solids, such as liquid and solid helium, which have the promise of revealing new fundamental behaviors at very low temperatures. Two of the three bays at the Microkelvin Laboratory are run through the National High Magnetic Field Laboratory (NHMFL) user program and are available for use through a peer reviewed proposal process. 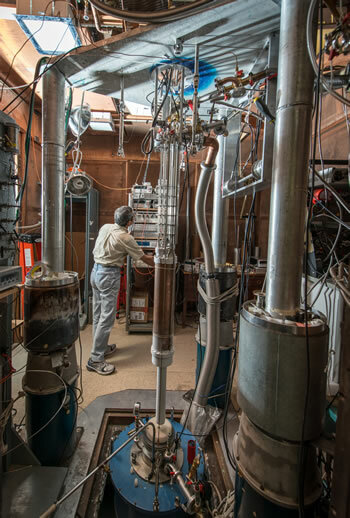 The Microkelvin Laboratory is dedicated to the study of exotic states of matter that occur only at the extremes of physical parameter space: ultra-low temperatures, high magnetic fields, and high pressure. Areas of recent research include: quantum criticality, phase transitions in quantum fluids and solids, frustrated magnetic systems, spin ice candidates, Bose-Einstein condensation of magnetic excitations, and quantum Hall effects.